There are many ways in which a person can become successful. Some people are smart, some are talented, but what unites all of them is the ability to bend their schedules and lives to create a perfect environment for work and leisure. Most of their habits are pretty common: eat well, wake up early, not waste time, but others are a bit more interesting. 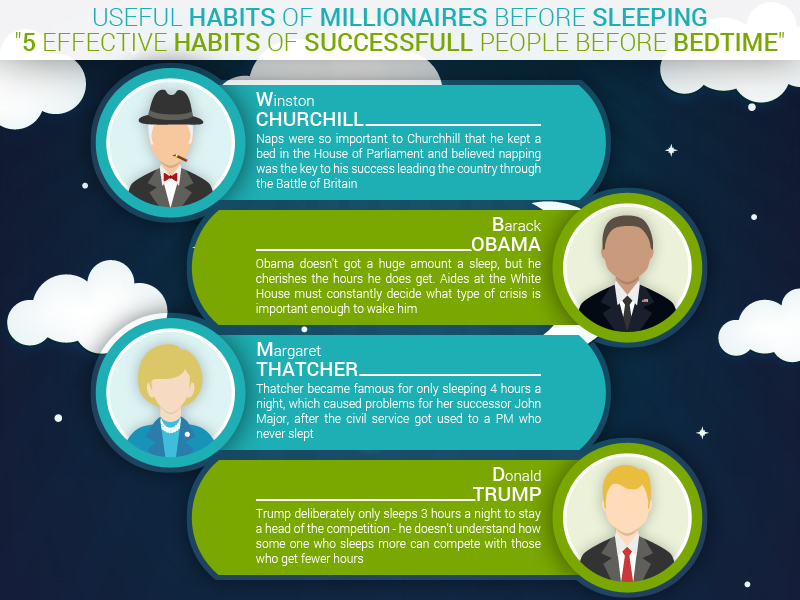 Let’s take a look at the bedtime habits of the mega-successful people. Bill Gates, the founder of Microsoft, spends an hour every evening reading books. An obvious reason for this is to gain knowledge, but reading has also been found to reduce stress and improve mental health long-term. This might not be Gates’ secret of success, but it definitely helps him stay sharp as he’s approaching eighty. Arianna Haffington’s tips for success used to include working herself into exhaustion and always staying available for employees. However, several years ago, the media mogul collapsed and had to get stitches for her head injury. Nowadays, she advocates for “unplugging”: the practice of turning off phones and computers before bed. There’s even hard science to back her decision up. Harvard researchers have found that the light produced by various digital devices disrupts our natural rhythm and production of necessary chemicals in our brains. Many Silicon Valley entrepreneurs and even the CEO of Buffer have talked about the benefits of walking in their interviews. This secret of success is a bit counterintuitive as many of us already feel exhausted after a long day. However, if you are a white collar employee, it is your brain and not the body that did all the work. Additionally, walks increase creativity, improve muscle tone, and give people an opportunity to clear their heads. There no better source of tips for success than the legendary Oprah Winfrey. And according to her, meditations help her go through the hardest times. Some people are quite skeptical about this practice, but a study conducted in 2014 clearly proved that meditating can reduce pain, stress, and even fight depression. Vera Wang is one of the most popular designers of the last decade. Her gowns are coveted by celebrities and politicians alike. Surprisingly, most of her excellent garments are created before bed. She stated several times that the quietness of the night helped her with a creative block. An Albion College study backs up her words. In this study, it was revealed that the non-optimal, less structured hours of the day are better for coming up with new ideas. Whatever your evening routine is, you can try to tweak it to include these new, productive habits. You can also try to plan the next day as it has been found to improve managerial skills and free more time for doing the things you love.